I am attending the PLA conference in Philadelphia, PA and writing this from my hotel room, which is not IN Philadelphia,but in the heart of Pennsylvania Dutch country in Lancaster County! A little nutty of me, but it's much less expensive than the city and it's a hotel my family loves, so I decided to give myself a bit of a treat. It does mean I'm spending extra time in my car driving back and forth, but most of the trip is lovely--it was delightful driving through the rolling hills dotted with farms as the sun rose this morning. So cars were on my mind this week, and before leaving for this trip I did a car program for my Tuesday and Wednesday morning groups. I'll give more details about the program,but I did want to get this flannel board song/game up in time for Flannel Friday! It's from the ever wonderful Nancy Stewart and you can find this on her website--the pattern and the song, which is called "Lots of Cars". 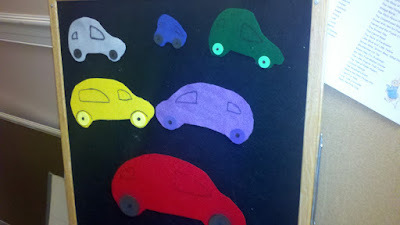 I made the cars from felt, with with black pen windows that I drew freehand. The wheels are glued on foam circles. I made the whole thing in a bit of a hurry--you could easily fancy this up a lot. There are lots of cars driving on our street. Tell me what color car do you see? Tell me which color car is the smallest? And the largest. And you could probably do other things as well. I turned it into a guessing game as well, akin to the owl "Whoo's Missing"game. Tell me what color car is missing? We did this with take away one car, then take away two cars. With older kids I might use more cars and remove more! Nancy Stewart has such great storytime songs. A favorite of mine is Dinosaurs Ridin' in Cars, although it really gives you a workout.